Chemicals are found everywhere in nature, including in the food we eat and the water we drink. Some of these, like vitamins, contribute to maintaining good health, while others increase aroma and flavour and make food enjoyable. Some plants also contain chemicals that are poisonous to humans and we have learnt to avoid eating these. Can some natural food chemicals cause unpleasant symptoms? Salicylates are naturally occurring in many fruits, vegetables, herbs, spices, tea, coffee, honey and mint flavours. They are more or less a natural pesticide that plants produce to protect themselves from predators in nature. Sometimes salycilates have a bitter flavour or make animals or insects feel unwell when they eat them. Fruits and vegetables are higher in salycilates when they are first picked or less ripe, and levels drop as they ripen and with cooking. They are also present in higher amounts in the skin or outer layers. Amines are produced as a result of protein break down. Foods like meat, cheese and fish increase in amines as they age or mature, and in fruits and vegetables as they ripen or ferment. Glutamates are an amino acid and a part of all proteins. In foods they may be found attached to a protein or in their “free” form. When they are found in their free form they enhance the flavour in food. Foods rich in natural glutamates like cheese, tomato, mushrooms and meat/yeast extracts are often used to flavour cooking, and MSG (pure monosodium glutamate) is used as an additive in savoury snack foods, soups and Asian cooking. How do food chemicals trigger symptoms? When foods that contain natural food chemicals are eaten they are digested and absorbed normally. They do not trigger an allergic reaction or involve the immune system at all. Instead, reactions occur in sensitive people when food chemicals irritate nerve endings in different parts of the body. Much in the same way that some people experience more side effects from medications than others. Do people have different tolerance levels to food chemicals? How much you can tolerate will vary depending on how sensitive you are. Some people have a much lower tolerance threshold than others and will experience a reaction to smaller amounts. Others though, will find that levels build up over a few days before their tolerance threshold is breeched and they experience symptoms. Chronic or recurrent symptoms can occur when small amounts of high chemical foods are eaten regularly. When this happens levels build up in your system gradually and specific triggers are not obvious. What symptoms do they cause? Nervous system irritation like headaches, fatigue, flu like aches and pains, moodiness or in children behavioural problems including ADHD. Gastrointestinal irritation, including reflux, mouth ulcers, bloating, cramps, diarrhoea or constipation or both. What foods contain food chemicals? Food chemicals are found in a great variety of foods, many of them are generally considered healthy. The lists below are examples and are not exhaustive. How do you know if you are sensitive? 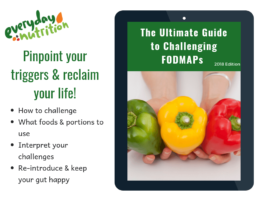 Since the immune system is not involved, there are no reliable diagnostic tests and the only way to know for sure if a food is triggering your symptoms is through a strict elimination and structured re-challenge process. This can be a difficult process and there are many factors that could mislead results, so this is best done under the guidance of a dietitian with expertise in food intolerances. There are many tests that claim to diagnose food intolerances, but most are unreliable, expensive or both. You can read more about this at the Australasian Society of Clinical Immunology and Allergy here. How do you manage food chemical intolerances? Since food intolerances do not involve the immune system or cause physical damage, foods only need to be restricted as far as symptoms dictate. Once you know which foods are causing your symptoms, your dietitian will work with you to determine your individual level of tolerance. This will then dictate how much restriction is required to prevent symptoms in the long term. Since symptoms are caused by irritated nerve endings you may find that tolerance threshold moves over time depending on what else is going on. If you are in a particularly stressful period of life, you may need to pull back a little to prevent or manage symptoms, whereas when things are going well and you are relaxed you may find you tolerate higher amounts of food chemicals. If you are familiar with the low FODMAP diet you will notice some cross over with foods high in food chemicals and that some of the food chemical symptoms are similar. It’s not uncommon for people with food chemical sensitivities to get some relief following a low fodmap diet. Symptom relief is usually more noticeable in the initial stages of a low fodmap diet with effectiveness diminishing over time. Other food chemical red flags include persistent unexplained symptoms or reactions to low FODMAP foods. It is important to note that FODMAPs cause symptoms when certain carbohydrate molecules are not fully absorbed in the small bowel. These molecules then draw fluid into the bowel as they continue along the gastrointestinal tract and are fermented when they reach the large bowel resulting in bloating, cramping, gas and altered bowel habits. These symptoms usually occur within about 6-24 hours after consuming a trigger food, are often related more to specific foods and are generally confined to abdominal symptoms. One of the things I love about being a dietitian, is that nutrition and food intolerances are seldom black and white. Food chemical sensitivities can occur in isolation, alongside other intolerances, including FODMAPs, wheat, cows milk protein, coeliac disease or allergies. If you think you are having issues with food chemicals make sure you see a dietitian with expertise in food intolerances. They can help you put together an effective management plan to assist in managing your symptoms.